Ah, a new year. It will indeed be good. I wish all a great New Year! At the festive meal for Rosh HaShanah (seder), many people hold the custom of eating a pomegranate in order to say a special blessing thanking Gd for "bringing us to this season," which essentially means thank you for the chance to be where we are. I hope we all can truly say thank you for being here, alive, with the chance to do so much good. A new year should not be for personal commitments. Rather, it should be dedicated to improving the lives of others. That's the message of Judaism. That's the lesson I am going to take from Rosh HaShanah. 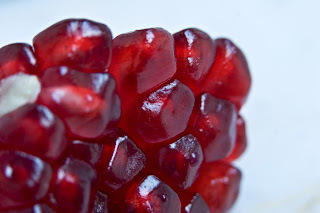 The pomegranate, the seeds of which you see above, is a special fruit to Judaism. The Bible lauds the Land of Israel for its pomegranates. The seeds of this delicious and spiritual fruit symbolize to Jews the abundance of good deeds with which we aspire to. In fact, the Talmud says that "even the wicked among Israel are filled with good deeds like pomegranates are filled with seeds." Hassidism teaches many mystically beautiful lessons from that concept. Click here for my post on Rosh HaShanah last year, the first month I was a citizen in Israel! It has two good stories in it, one of which is an awesome story from an Israeli soldier who became interested in religion from the Lebanon War - you can probably guess why. There are no atheists in foxholes, right? So "pomegranate" in Hebrew = "Say hello to my lil frien'" in English? Crazy! Keep your positive nature throughout life! It will always help get you through difficult times. You are a remarkably reflective young man. I am so proud of you. Let us know if you find the pomegranate meaning linked to grenades. That's quite interesting. I think "rimon" meaning grenade is just because of its shape; no esoteric meanings there, I'm afraid. I wish you a Gmar chatimah tovah.